Yesterday’s signals were not triggered, as none of the key levels have been reached. Trades must be entered between 8am New York time Tuesday and 5pm Tokyo time Wednesday. — Go short following bearish price action on the H1 time frame immediately upon the next touch of 0.6802. — Place the stop loss 1 pip above the local swing high. — Move the stop loss to break even once the trade is 20 pips in profit. — Take off 50% of the position as profit when the trade is 20 pips in profit and leave the remainder of the position to run. — Go long following bullish price action on the H1 time frame immediately upon the next touch of 0.6708, 0.6677, or 0.6655. I wrote yesterday that although there was no long-term trend in this pair, the medium-term momentum was with the bears. The price has continued to fall slightly but not by much. The most notable feature is that the NZD is looking more bearish than the AUD which is in itself a bearish sign. 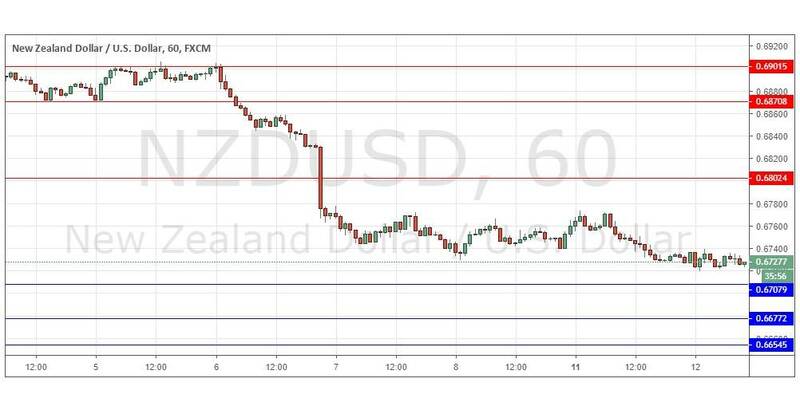 The price has been moving sideways and is quite likely to do so for the next several hours until the key central bank releases from the RBNZ due later which are likely to cause higher volatility, and which can easily push the price in any direction, so there is no point in anticipating direction here before that event. Regarding the USD, the Chair of the Federal Reserve will be making a minor speech at 5:45pm London time. Concerning the NZD, the RBNZ Monetary Policy Statement, Rate Statement, and Official Cash Rate will be released at 1am, followed by Inflation Expectations and a press conference at 2am. Risk On Returns To FX – But For How Long?